After a long day of classes and fulfilling other responsibilities (especially if you're trying to balance teaching and grad school), it’s hard to keep your eyes open while studying. You may find yourself fighting to keep your eyes open or dozing off while reading. If you’re struggling to stay awake, it’s going to be difficult to remember anything that you’ve studied. 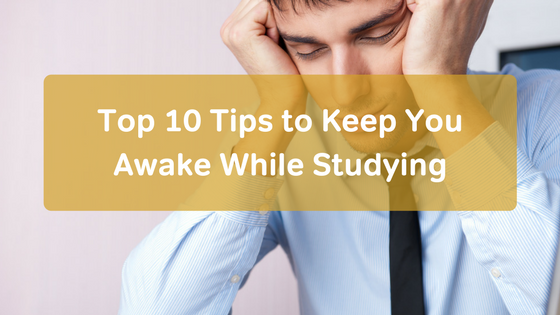 To fix this, try these tips to keep you awake while studying. Eating fattening foods will make you feel slow and sluggish. If you want energy and want to stay alert while studying, you need to eat a healthy and balanced diet. Choose foods high in nutrients like salads, soups, potatoes, and lean proteins. For sugar boosts, stick to foods like apples and oranges with natural sugars. Dehydration makes you sleepy. To combat this, make sure that you drink plenty of water while studying. Keep a water bottle with you, and start drinking whenever you start to feel tired. Chewing gum can keep you awake and alert. Have a few packs of your favorite gum flavors with your books and notes, so you can grab a piece when you need it. To prevent mental exhaustion, try to rotate what you study. When you start to feel yourself fading, move to the next topic that you need to cover. Drinking caffeinated beverages is another way to stay awake. However, the Mayo Clinic recommends drinking no more than 500-600 mg per day. (Note: an 8-ounce cup of copy has just under 100 mg of caffeine.) Rather than drinking all of this at once, you should space it out throughout your day. Since alcohol makes you sleepy, it’s a good idea to refrain from drinking it while studying. Save it for your post-test celebration! A power nap only lasts 20 to 30 minutes, but it can make all the difference. If you have time between classes, take a quick nap to help you get through your study session later. Also, make sure that you try to get 7-8 hours of sleep every night. And, stick to the same sleep schedule every day. As a freshman in college, my roommates and I would do workout videos during study breaks. Getting up and moving was the perfect way to keep us awake and alert. You don’t have to do workout videos to get the same benefits. Just get up and move. Walk around the room. Jump up and down. Stretch. Just find a way to get your blood flowing. To stay awake while studying, find a study partner or study group. The company can help you study while making sure that you’re awake and focused. Before you settle in to study, get your study area ready. Just don’t make the area too comfortable. Use bright lights, keep the temperature slightly cooler than normal, or get rid of your chair and stand up. For effective study sessions, you need to be more than awake. You need to be alert and focused. You need to be able to remember what you studied. Try these top tips to keep you awake while studying and focused. And, if you're looking for more general tips on teaching, we've got some great tips on staying organized and setting personal goals.